Teachers can generate the Student Advanced Report as this report helps to gather all the important student data at once. 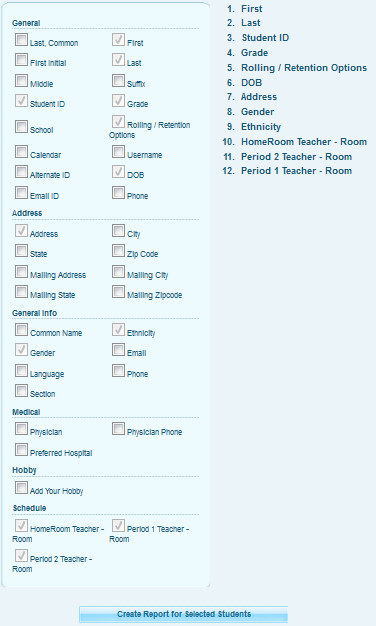 It includes Student's Demographics, Address, Medical, Custom fields and Schedule info, that can be printed together. To generate an Advanced Report, go to Students >> Reports >> Advanced Report. Search the student or group of students with proper criteria and click on submit. A list of students will show up, select the students by checking the boxes beside their names and click on Create Report for selected Students. Your screen will display a list of label fields. Select the fields that are required to generate your customized report for selected students and click on Create Report for selected Students. The selected field details appears in a report format allowing easy print of the page as the following.